The purpose of this article is not to say something in favour or against religion. The purpose of this article is to simply present hard data on the number of religion-affiliated people based on the most valid (and publicly available) sources, so that the readers can extract their own conclusions on spirituality in the world. I have made an attempt to use sources that can be found by everyone on the Internet, so that the validation of things written here is easy. Any comments and corrections are more than welcomed! ΙΧΘΥΣ. Fish extinction. Science as a Religion. Christianism as a... well, NOT a religion. Most of the above sources are free and constrantly updated and that is why they seem to be the best we have at this moment. The Global Christian Encyclopedia also is a good source of religion statistics, but it is not offered for free and that is why it is not included in the list. Any comments for new sources are welcomed. It would take hundrends of pages to just present all data from the abovementioned sources. That is why I will try to present the main data only for Christianity and Islam here. These are the two main religions in the world and their analysis offers a very good perspective of religiosity all over Earth. Here I will just show the numbers related to Christianity for some major developed countries of Europe. The source I use for these numbers is the respective page of Wikipedia for religion demographics. It seems that Christianity continues to hold a high and stable over the years percentage in western countries. From the above table one can easily understand that Christianity is still strong in all European countries, despite the hard materialism that some try to impose on the modern era. It seems that religiosity is not dying – quite the contrary. Countries where technology, fashion and consumer goods have a great footprint, still have a vast and stable majority of Christians in their populations. Passion. Man. The duty of theosis. From the abovementioned data it seems that people still believe that a First Cause must exist, as Aristotle once postulated… Religion is still alive despite the wishes of many…The atheism mystery…If one looks at the atheism numbers at http://en.wikipedia.org/wiki/Demographics_of_atheism he/she will be able to see one more interesting thing: the remaining percentages that are not Christians, are not atheists! Many people tend to claim they are “not religious” but on the same time they do not claim they are atheists. That leaves a lot of room for interpretations and theories. For me this is an indication that many people, although they tend to believe that there is something of “higher power” in the cosmos, they do not feel affiliated with any church because of the wrong-doings of those churches. Because if they were convinced that nothing like a God exists, then they would have no problem claiming “atheists”. As simple as that. 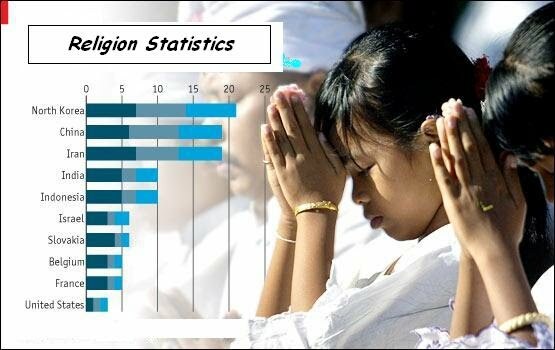 The Carnegie Endowment for International Peace using the 2000-2005 edition of the World Christian Database, concluded that high birth rates were the reason for the growth in all six; however, the growth of Christianity was also attributed to conversions. Although the World Christian Database does not cite sources, a review examining the reliability and bias of the WCD found it “highly correlated with other sources of data” but “consistently gave a higher estimate for percent Christian.” The Journal for the Scientific Study of Religion said that “on the whole we find that the WCD is reliable. Data from Encyclopedia Britanicca(which can be found at the same page) show more or less the same results, but with slightly more increased growth rates for Christianity, reaching to about 6% for the years 1995-2002.As for Islam, it seems to be getting stronger and stronger. The main reason for that seems to be the higher birth rates of Islam believers. Europe has already been witnessing such a growth withing its countries. Untitled — Is the world divided by religions? Each faith attempts to gain more followers at the expense of the others. Untitled — So it is. But civilization also advances through radical things said by such people. Untitled — SpirosKakos, the trouble when some wise man turns up, they usually turn against as a crank and caste him out because he will have to be radical to turn things around. Untitled — I am with the “some wise man/woman will find the way” answer.I understand that civilizations evolve in time. But what do you mean by the “weaker civilizations”? Is is the one who has less evolved weapons? It must be it, since there were civilizations who managed to know more than we do about the environment or about human relationships, who were still extinct under the pressure of the “evolved” westetn civilizations. Untitled — SpirosKakos, your question will illicit controversial and provocative answers from me. (1) Cultures belong to tribes, and tribes are made up of people, and people are still evolving from the dark ages in to 21st and future centuries. Whether some tribes prosper and evolve into nations that occupy 1/2 the earth or perish and disappear from the face of the earth depends on the wisdom or their tribal leaders and on geo-physical events beyond the control of man. Through evolution and the blessings of the cosmos, several tribes or cultures have survived the ravages of time and circumstances like: Judaism, Christianity, Islam, Hinduism, Buddhism, Taoism, and many other minor cultures. (2) Prior to WWII, a strange kind of enforced equilibrium existed in the world dominated by the European Colonial Christian ethos. The Colonialists spread their ethos to all those heathen countries and it left their mark. But since WWII a new culture began to sweep and capture the imaginations of the new liberalists, i.e. secularism, multiculturalism, and liberalism. But does this signal the death throes of the Judea-Christian tribal culture? In its death throes, something has to replace that void. Geo-physics, geo-politics, economics, and tribal cultures will now play the deciding factors for the future. Essentially, some cultures are indolent and inclusive, but others might be exclusive and dominant. Do we allow evolutionary forces to rule or to we intervene so we can determine the type of culture we are willing to accept? In either case the consequence will be painful and the question is which pain do we chose to tolerate and at what price? (3) As a natural consequence of evolutionary forces, the weak will perish and the strong will rule, unless man decides to counteract by intervention the natural evolutionary process. Of course some ignorant scientists will try, like forcing the adoption of atomic power plants with no real thoughts of how to handle the waste products, that will eventually poison the whole earth around us leading to our demise anyway. Others will force through “secularism & multiculturalism” again a non-reversible process once it takes off. I put this question for you to ponder on, “Are we on the road to self-destruction?” Or will some wise sage find the solution before we destroy ourselves? Amen. Untitled — So do we need to protect the individual cultures of every civilization or do we need to go into one single uniform culture? Your thoughts? Untitled — SpirosKakos, Religion creates cultures, and cultures start within tribalism, and tribalism divides rather than unites people. Some cultures are more exclusive and thus divisive than others and that is the root of our problems. Untitled — The world is divided in religions as in many other things, don’t you agree?